Interior design, office fit out and refurbishment projects in Edinburgh, Glasgow and Newcastle. Office relocation and refurbishment is an experience that once completed, no-one is ever in a hurry to repeat any time soon. Traditionally, a range of professional services along with trades and furniture/hardware suppliers are engaged by various means including word of mouth, tender and incumbent suppliers. When ST Microelectronics from Edinburgh, decided that they would move rather than refurbish their existing premises, they took an early decision that they wanted to deal with one supplier only. A one stop solution provider on a interior design and office fit-out project of this scale means you need a serious business to deliver – especially when this also had to include specialist removal and hoisting work which involved lifting equipment weighing 1000kg and clearance tolerances of less than 5mm! Step up Amos Beech and the team. 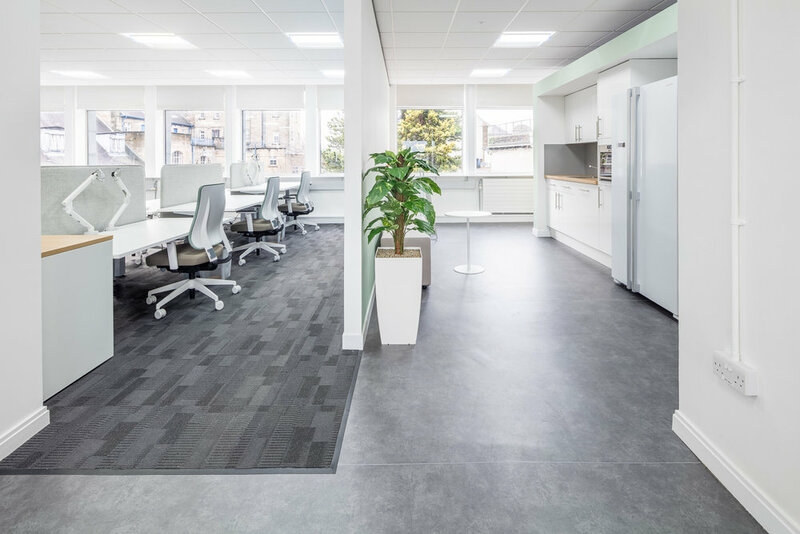 Having worked with ST in Edinburgh for the previous 15 years in their old offices, their track record meant that they were invited to tender for the project along with two other firms. 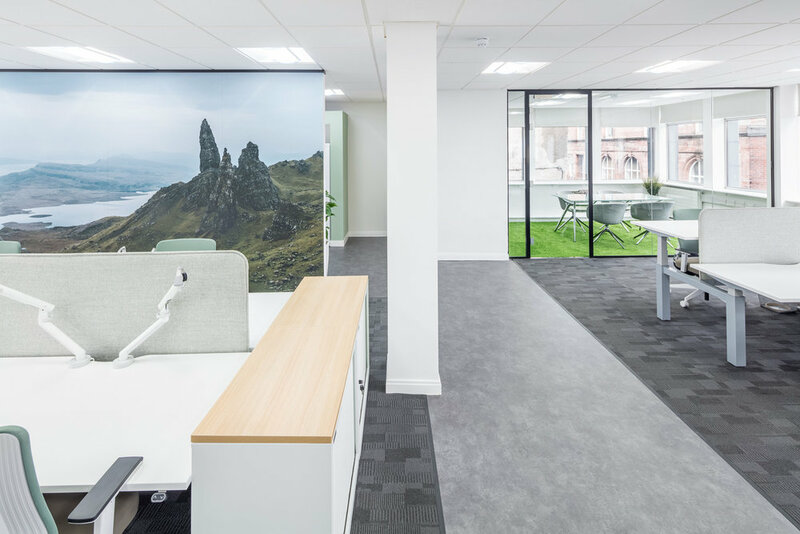 Demonstrating a deep understanding of the ST requirements and combining this with a highly effective theme that accurately reflects their branding, they duly won the contract to fit-out the new office space in Ediburgh. As with any project, a tight timeframe was expected and the Amos Beech team of Commercial Interior Designers Edinburgh were under the cosh. Working with our Construction Team and Quantity Surveyors, design integrity was maintained whilst keeping a firm eye on the budget. Key to the project being heralded as a success was keeping the staff on board and committed to the move. Along with this, a similar narrative meant that the new environment delivered on prospective employees’ vision of what a hi-tech firm like ST should appear like. Andy Price (Edinburgh Module Director) stated himself that he didn’t want to hear that the reason a recruit didn’t join was because of poor quality office was ever repeated! A large portion of the available space was carefully designed around the laboratory and dark room requirements. Specifications included compressed air, clean power and uprated flooring to take the heavy equipment that was to come. As part of this, a fire strategy had to be incorporated so that staff can escape from a darkroom in the event of a general evacuation alarm being given. An advantage of the Tanfield space in Edinburgh is rather than being spread over 2 floors (which was the case in their old offices), all of the staff are on the same level and already the benefits are being reaped. A spread of informal and formal meeting spaces have been incorporated into the design. This allows staff to meet and discuss projects much more informally in a selection of spaces. Research tells us that when given a variety of spaces, both in terms of location and style, staff are much more likely to benefit both in terms of communication and positive outcomes. There were 1 or 2 pieces in the puzzle that were picked up on very early in the interior design and office fit out project and the Amos Beech team were keen to preserve them. The first was table tennis, in the early days there was a table tennis table and this had disappeared as lack of available space dictated. This has been reinstated and it is use almost continuously throughout the day. The second point was a space where all of the staff could gather for company announcements. A town hall space has been incorporated complete with tiered seating which when used with an operable wall, the whole space can be opened up to seat 150 staff every 4-6 months. All staff sit at electrically adjustable sit/stand workstations and it is interesting to see how this added functionality is actually being used by everyone. What is more interesting is that previously the staff worked from old fashioned ‘corner’ desks with side extensions giving them 2.4m x 2.2m footprints and now they all work from 1600x800 workstations with dual monitor arms. And there are no complaints! Feedback has been nothing but positive and it is clear that everyone is very proud of their new environment. When Scotland's only tyre manufacturer asked us to draft a plan for their office refurbishment and fit out in Dundee, the team here at Amos Beech set out to transform the 40 year old building. The Dundee plant has been transformed into a “state-of-the-art factory under the five-year investment programme. The Dundee factory opened its doors 43 years ago it is now the city's biggest industrial employer, with just 1000 staff. It manufactures more than seven million car tyres every year. The 'Bâtiment 10' or 'Building 10' hosts 70 office staff and every factory around the world has a 'Building 10' with office accommodation for similar office tasks. 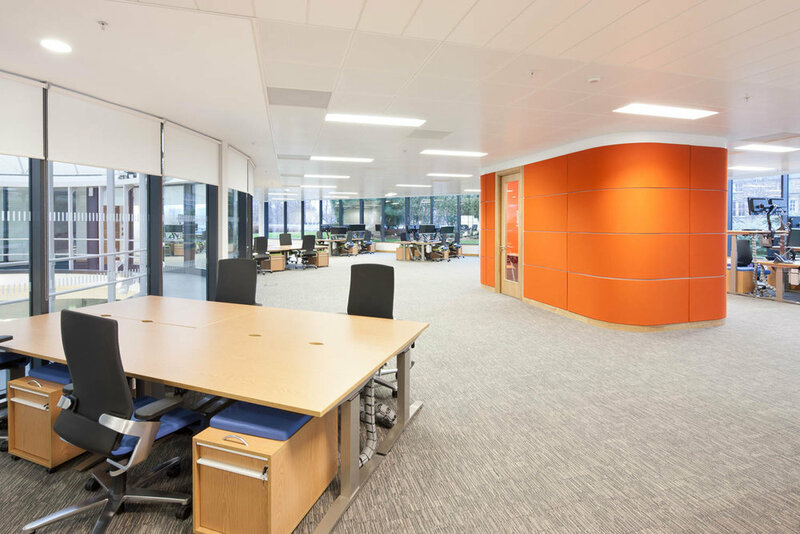 The need for this office refurbishment and fit out project in Dundee was clear from the outset. The building was old, uninspiring and even a depressing place to work. For a company of this stature, refurbishment was long overdue. Michelin Dundee is Michelin’s best-in-class and is now topping the tables in efficiency and quality. Dundee was the first first Michelin factory in the world to embrace wind energy with two wind turbine generators helping to reduce environmental impact and energy bills. It's standing attracts high profile visitors from across the world and needs an interior that you expect from a company like Michelin. The long rectangular building with cellular offices along corridors was to be transformed into a more open plan space with organic shapes. The desks were positioned off set from the walls and in the final design the wave desks were shaped nicely around the circular meeting pods. At Michelin 20 million euros are invested each year to develop new solutions for workstation ergonomics. Amos Beech have always been at the forefront of innovative seating and desking solutions and for this project sit-stand desking from Samuel Bruce, originally from Dundee was specified. The days that working days were an important source for people's exercise are long gone for most people, especially for those that work in offices. Sedentary working applies to in between 4 and 6 hours per day in an average office and in total you are talking about 9 and 11 hours a day! A sit stand desk will bring in more variety in working posture during the day and reduces health risks. It also gives the flexibility in adjustment an international workforce like Michelin needs. Changing between sitting and standing increases concentration and output which is essential for a best-in-class tyre manufacturing plant. 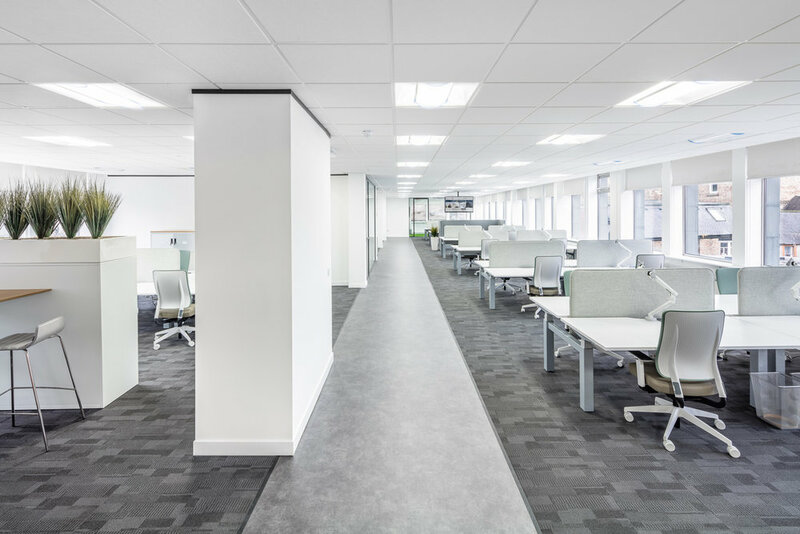 The office refurbishment was completed over two phases. We started on the ground floor and the initial works included the removal of part of the 1st floor to open up a more impressive staircase entrance reception area. A new staircase was manufactured to the designers specifications and all internal doors were replaced. As the project was underway it was decided to build an entrance vestibule in front of the reception and despite the already tight time frame, this had to be completed within the timescales allowed. Walls were opened up and replaced with glazed partitions to allow light to flood through the interior. These new glass partitions have been subtly branded with the iconic Bibendum and other Michelin marketing images. The overall interior design scheme takes full cognisance of the Michelin brand and uses the approved branding colour palette to establish the Michelin identity whilst retaining a sense of belonging for the individuals who work in the space. When the second phase started, we had to remove from the building a large safe that had been built in originally. Heavy lifting equipment and careful health and safety planning allowed this to happen without delays or damage to property or person. As part of the overall scheme, all external single glazed windows were replaced by new double glazed units to improve the thermal efficiencies of the building and the heating and ventilations system was similarly upgraded to meet with the current standards. The end result is a refreshing and modern interior which is already making a huge difference to the first impressions given to visitors on arrival. Going forward the Michelin management team are confident that the investment will reap rewards in terms of productivity and staff satisfaction. Little did we know that when we started working on our own corporate video way back in 2017 that we would be filming some frames in the winter of January 2018 at the offices of CitNOW in Stirling. We had just finalised the details for the interior design and were planning to start the office refurbishment in Stirling the week after. CitNOW is a provider of video services for the automotive industry. They have recognised that customer behaviour has changed dramatically over the last few years as the information required to make a buying decision is available online which affects showroom visits. That is where video comes in. CitNOW, who's product development team are based in Stirling, have developed a range of simple to use video applications that really make it easy for their clients to use video effectively. We perhaps should have known this earlier, but nevertheless are chuffed that their online research led to us. 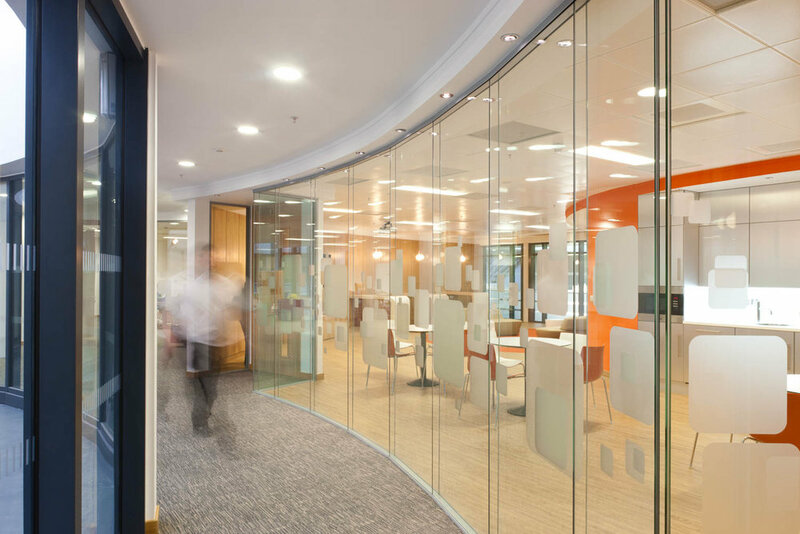 Amos Beech were initially approached by CitNOW along with a couple of other potential suppliers and we quickly differentiated ourselves by providing a level of service that gave them the confidence that we were the right partner to engage with for the interior design and office refurbishment project. The initial space that they were looking at was surveyed. From this we were able to give them a trial fit to demonstrate how much room for expansion they would have as the company is looking to grow significantly over the coming years. Whilst this space worked in principle, the location was not perfect, and we were then asked to assess the space they actually moved into a couple of weeks later. Once again, our interior design team carried out a space survey and produced a trial fit along with some high level costs to compare against the previous space. Their preference initially was to have air conditioning but whilst nice to have, this was going to be difficult to install as the building is listed and in a conservation area. The project quickly progressed and the new space won CitNOW’s approval. Amos Beech were instructed to carry out the design and build of their new offices. A full drawings package was created, and our construction team moved on to site and got the build program underway. For the interior design, the office furniture and finishes have been kept minimal by using light oak, whites and greys to keep the area feeling light and airy. We installed a ‘clear erase’ backwall to be painted on. This allows the surface to become dry erase, therefore can be used with white board and chalkboard pens. By making the wall a writable and wipeable surface, it supports innovation and creates opportunities. CitNOW were concerned to make sure that the furniture they ordered for their new offices was going to meet the ergonomic needs of their staff. After careful consideration of the various options they selected the Viasit Drumback chair for their operator seating which is winning awards for its new and innovative features. For the desking, they selected the Samuel Bruce UP2U electrically adjustable sit/stand desks with full cable management to keep the environment clean and clutter free. In the boardroom Wilkhahn's new meeting chair, the Occo, is paired with Actiu’s innovative Cool500 table system – a tool free flexible table system that allows quick and simple reconfiguration. Break-out areas, collaboration zones and quiet areas are all included in the space as well as a great meeting room where we installed astroturf on the floor and paired this with a glass table and some great informal meeting chairs. Vinyl graphic of Old Man of Storr made from image taken by CitNOW employee Robert Fyfe. Avaloq chose Tanfield in Edinburgh for their new World Software Design Centre for Excellence for various reasons including the availability of highly trained graduates from Edinburgh’s Universities. What they also realised was that they might be able to attract the best staff but more importantly they needed to keep them too. Part of this vision was to create a working environment that looked after the health & welfare of their staff as well as being an inspirational place to be. With gaming facilities, bean to cup Italian coffee machines and a full size pool table providing some refreshment and entertainment in the break-out zone, the serious bit in the design teams had to be something special. 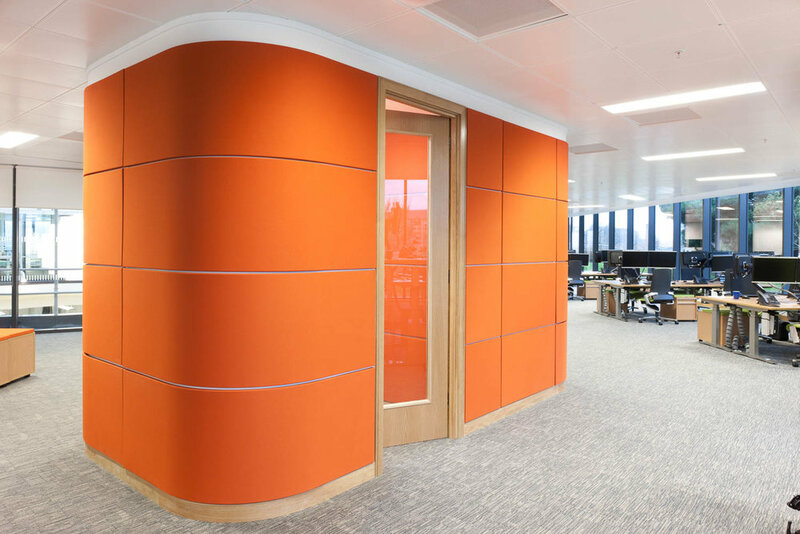 Amos Beech worked very closely with Edinburghs' premier interior design team Cubit3D to seamlessly integrate all aspects of the design into the office fit out. Office furniture supplied includes Samuel Bruce electric height adjustable workstations, Wilkhahn Trimension 3D ON task chairs, Humanscale M8 dual monitor arms, Wilkhahn Confair and Logon meeting room tables, Hitch Mylius reception chairs, Arper Catifa café seating, Tacchini Polar sofas and matching coffee tables. Wilkhahns ON 3D chair was selected above some of the best known chairs in the world at evaluation stage and the Samuel Bruce height adjustable desking proved its quality and value for money along with a range of customer selected options that made sure that it was exactly the right solution of the client. The dual monitor arms from Humanscale were rigorously tested by the client to ensure they would support the large monitors that had been specified. The integral cable management keeps the overall look very clean and uncluttered. The panoramic views across Edinburgh’s skyline completed the picture.